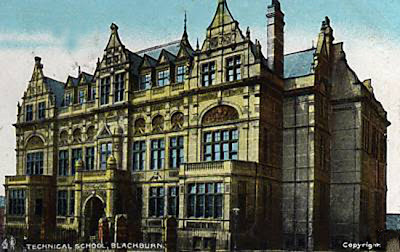 Here is one of Blackburn's finer buildings. Construction started in 1889 and wasn't completed until 1894. Happily, this is one building that has survived through the decades, although it has been threatened with demolition from time to time and has altered radically, at the rear. It is now a part of the Blackburn College campus and is currently known as the Victoria Centre. The frontage as seen a few modifications since it was built, the saddest being the removal of the six small windows to be replaced by skylights. One other notable difference is the shape of the bay windows at either end of the frontage. In this picture they are rectangular in shape, whereas now the sides of each bay are angled. Why would they alter these? I have no idea why they replaced the six windows along the top. I don't think the bay windows with the balconies have been altered have they? - Is it not just an optical illusion, caused by the angle of this photograph / view?